28 FEB, 2018. 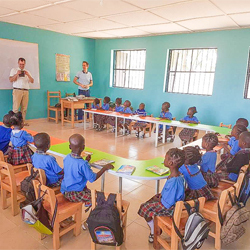 A huge “Thank You” to Misean Cara, who grant-aided the funding of a block of six classrooms for St Mary’s School in Ijio, Oyo State, Nigeria. In addition to the classrooms, the school has also been secured by perimeter fencing, which keeps intruders, passersby and animals out. 31 JAN, 2018. Congratulations to the two Sisters of St Louis, who graduated with First-class honours from Veritas University, Abuja, Nigeria, on December 4, 2017. 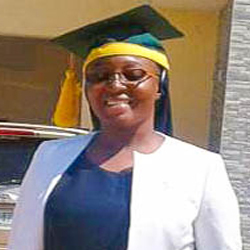 Mary Taiwo Ogunjobi SSL, who studied Economics (Education), was the fifth best candidate of her year, while Lois Moses SSL, who studied Educational Management, was the best candidate in her year, and was awarded valedictorian. 20 DEC, 2017. 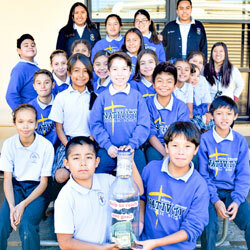 The Class of 2020 in the Nativity School in El Monte, California, has embarked on a huge fundraising drive, to raise $10,000 for the Sisters of St Louis’ mission in Dawhan, Ethiopia, by the time they graduate. 29 NOV, 2017. The climax of the year-long celebration of the Platinum Anniversary of St Louis presence in Ghana took place on October 21, 2017. The Eucharistic celebration took place in the auditorium of St Louis College of Education in the presence of sisters, Monsignori, priests, religious men and women, family members, current and past students of St Louis Schools, and friends and well-wishers. 29 NOV, 2017. 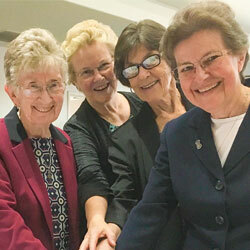 Congratulations to the four sisters in the California Region, who celebrated their jubilees last month. Joanne Connolly SSL, celebrated her 60-year jubilee, and Judith Dieterle SSL, Donna Hansen SSL and Margaret Hosty SSL, celebrated their 50-year jubilee. A beautifully-prepared Jubilee Liturgy took place in St Bernardines Parish Church in their honor, which was followed afterwards by a celebratory lunch. 29 NOV, 2017. 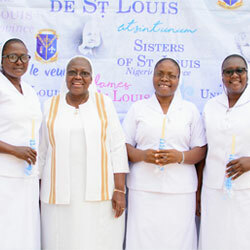 There was a double celebration of God’s love in the Nigeria Province on November 1, as Isabel Mann SSL celebrated the golden jubilee of the final profession of her vows, and three sisters - Fidelia Taye Amoko, Margaret Anno Dauda and Susan Gertrude Ashia Didam - celebrated the final profession of their vows. 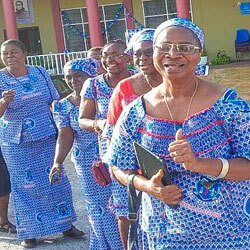 Louisville Girls Secondary School Abuja Is 10!